FC Barcelona reportedly submitted their 30 man squad for UEFA Champions league upcoming season. In front line as usual the trio strength Suarez, Messi and Neymar has been included. The former Valencia striker Paco Alcacer who joined the side before deadline day, is also included in the 30 man squad. Marc Cardona, Alex Carbonell also placing in the side. Croatian professional Ivan Rakitic, Brazilian Rafinha also placed as the midfielder along with the new signing Andre Gomes. As well as the top flight Alena and Wilfrid Kaptoum is also added in the B side. They both very talented and last season scored in the Copa del Rey semi-final vs Valencia. Along with Sergio Busquets and Andres Iniesta there have few more names that included in the 25 man squad. The Catalan has attached the Brazilian defender Marlon Santos name in the B side. He became one of the eighth back who placed for centre-back position.The one more new summer signings right-back Nili, have been also on the panel of 25 players squad. The Argentine defensive midfielder Javier Mascherano, who has been playing for the side since 2010 is still in the squad for his breaking out performance. The most important role of goalkeeper is given to 24 years old Marc-Andre ter Stegen. There also include three more stopper as well as Dutchman Jasper Cillessen, Spanish Jordi Masip and the Jose Aurelio Suarez. The Nou camp’s are going to execute their Champions League campaign on September. 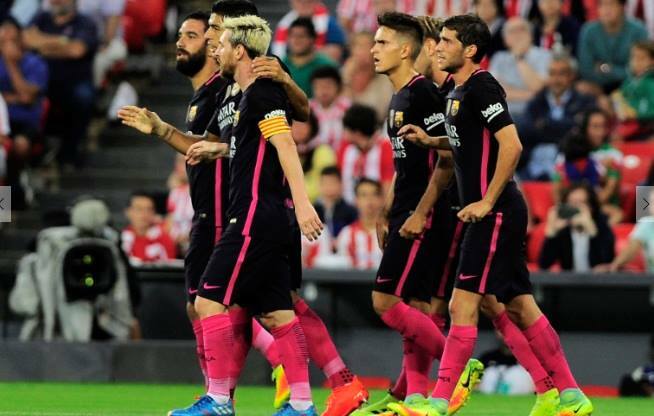 The debut match will be executed against Celtic at Barca home. This season they are grouped with Manchester City, Borussia Monchengladbach along with Celtic. Barca boss Luis Enrique has reportedly put forward the 30 man’s name who are in the squad of Champions league. Here the name of according to Luis list. DF: Javier Mascherano, Sergio Roberto, Lucas Digne, Aleix Vidal, Jordi Alba, Samuel Umtiti, Nili, Sergi Palencia, Gerard Pique, Jeremy Mathieu, Marlon Santos. MF: Sergio Busquets, Denis Suarez, Andre Gomes, Rafinha, Andres Iniesta, Ivan Rakitic, Arda Turan, Wilfrid Kaptoum, Carles Alena. FW: Luis Suarez, Lionel Messi, Neymar Jr, Paco Alcacer, Alex Carbonell, Marc Cardona. The last champions league was grabbed by Ronaldo’s Real Madrid. But this time Luis very serious about the trophy. They wanted to bag the title as well as La Liga competition. From 30, it is too difficult to choose best XI for the event. The best lineup yet not Published. Soon we update you about the fact. To get more linked with us.